Steve and I decided to put something into practice right away, and so we put the idea of our LOVE dollar into reality by signing up to sponsor a Compassion International child. The table just happened to be right outside the auditorium doors. Steve and I sifted through faces and names (how to choose a child when they’re all deserving?). We finally picked one and this was the start of a chain of events that we are still witnessing. It would take a book to write in detail everything that has taken place since that day, and is still taking place. And so, to simplify things a bit, I’ve made an item-by-item list of events that took place that have rocked our world. I have the journey outlined below. 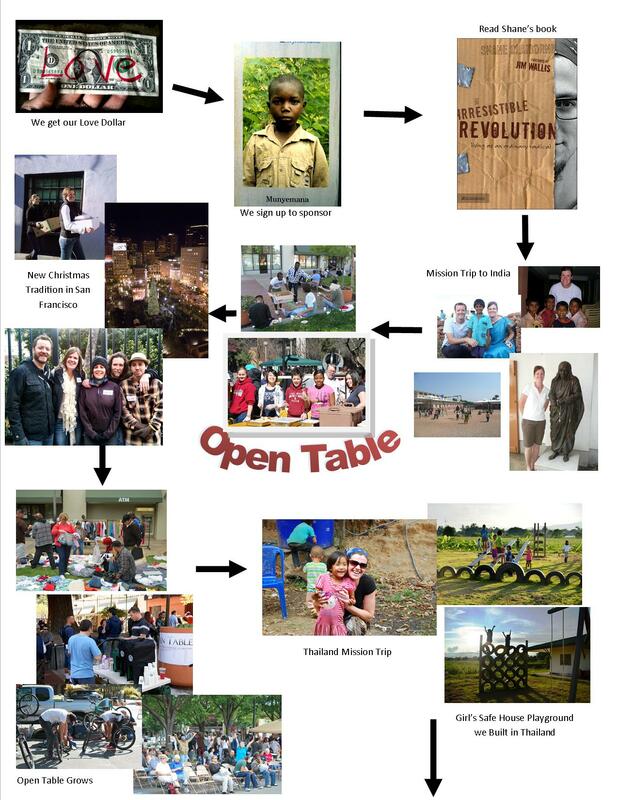 First, there’s a visual of the ripple effects of my Love dollar, and proof that small things with great love CAN indeed change the world – then after the pictures is a more in-depth list of what each step entailed. We received the LOVE dollar. We decided to sponsor a child right away through Compassion International. Months passed but the message is sank into my soul. Meanwhile we were preparing to go on a mission trip with our youth to India. We decided to include a trip to Mother Teresa’s house in Calcutta while we’re there. We go to India. In the plane I finish reading Shane Claiborne’s book, The Irresistible Revolution. It’s the perfect prep for my experience in India. We experience love with the orphans in India, and my prayer for self to be broken is answered. I realize that it hurts to be awakened to love and have my heart softened, but it’s a beautiful hurt. Those kid’s hearts are intertwined with mine. A piece of my heart is still in India…We visit the Mother House (Mother Teresa’s house in Calcutta) and are able to volunteer there. We also are able to go to an office of International Justice Mission in India and find out about helping those who are victims of human trafficking. We come back to the States and I decide to take Mother Teresa’s words to heart: “the world is full of Calcuttas. Find your Calcutta…” I see the poverty of our community and the empires of loneliness and emptiness we suffer from, including a paralyzing apathy that plagues most of us. Steve and I decide to stop spending so much money on ourselves at Christmas and start celebrating by giving, literally, to those in need. So we start what is our tradition now, of volunteering at San Francisco City Impact, the best way to spend Christmas, in my opinion. We continue Open Table, which happens at least 3 times a year now, and is growing with ideas from others, including a bike repair station, free coffee from Starbucks, and a toiletries booth, among others. I start a “Be the Change, Be the Church” project with my 11th grade class where I give them a LOVE dollar, and they have to come up with a way to change their world, which has resulted in raising hundreds of dollars for IJM (International Justice Mission), feeding the hungry in Healdsburg with leftover food from the cafe, raising awareness about human trafficking, to name a few. Went to Africa on a Mission trip, and then to Thailand, twice, where we lived with and worked with the hill tribe people in Northern Thailand. (To find out more, click here: http://www.adrathailand.org) We also had the opportunity to build a playground for a girl’s safe house, which houses and educates girls that are in danger of becoming victims of human trafficking. We fell in love with these people and see them as our brothers and sisters, and they compel us to find out more about how to raise awareness of human trafficking, and how to fight it. I and 5 students attend Freedom Summit 2011, a conference raising awareness about Human Trafficking and Modern-day Slavery and ways we can stop it. This compels us to continue to join the fight, no matter what, in stopping the injustice against our fellow human beings. We hear about many organizations and causes to join, including Not for Sale, Call and Response, IJM, Polaris Project, and others. We take this back to our school and the students become mobilized to fight against modern-day slavery. A four-year senior, David Kabanje, who has had a dream to be the first high-school to ever hold a REVO event, (short for Revolution) joins his dream with the cause of the students, and they plan and host the first ever high school led REVO event, which they entitle, “Fair for Fairness”. At this event they raise over $1600 to give to IJM to free 2 slaves. Through the REVO event we meet our good friends from One World Fair Trade store in Healdsburg, who bring a booth to the event. We sign the petition to have Healdsburg become a Fair Trade town, and this is also the start of a great friendship which has continued to bless us. 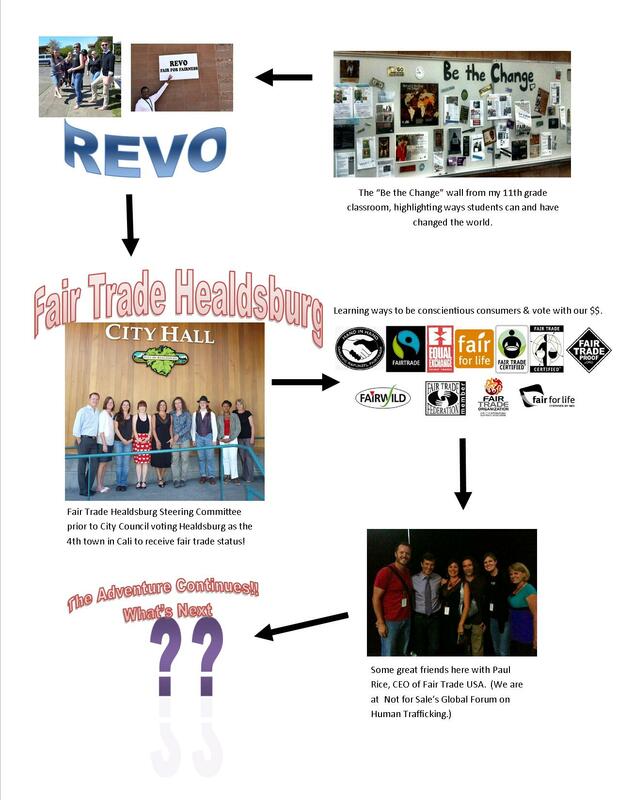 We get invited to join the steering committee to help Healdsburg become a Fair Trade town and accept. We meet amazing friends who also are passionate about justice and compassion in real, active ways, which drives our passion as well. We go to another event, Not for Sale’s Global Forum on Human Trafficking, where we meet and hear from some great names. We also continue to learn ways of being people of compassion, and learn how great love truly is and how it can, indeed, change the world, including our own souls. And the adventure continues! Can’t wait to see where it continues to lead! It will be fun to see where the adventure continues to take us. It’s amazing to see that in just a few years, you really can live a reality of adventure, justice, love, change and growth. Small things, with Great Love behind them, can indeed change the world. But more importantly, Great Love has and is changing me! This story is so incredibly inspiring and hard to read: my life has become everything I never wanted in re: to the Joneses; so my question is, what about average people? God led me into the life and responsibilities that I now carry, I didn’t intentionally become this way, so therefore it was His will, not evil materialism or apathy? So how does one, exhausted by a life of giving to the dying (I work in hospice) come to feel that my secular position is living the spiritual life of caring for others? Or even exhausted by providing for ones family on a daily basis through normal God given labor, for those of other careers? Why should we feel selfish for doing responsible living? These are sincere questions, not rebuttles or rebukes? Many of us do not have time or energy on our hands as we are not students nor are we afforded the privileged status and oppourtunities of pastors? Is what I am doing now selfish? Especially when God led me here. How do we unify both concepts of giving and living, exhaustion and lack of time and my need for rest and giving of my time to others when I am already exhausted by living ? Baby steps to giving? Doing what my passions already are in the context of church? God, why did you give me a life of responsible living, when all I ever wanted was to serve You? But is what i am doing already not the same as a trip to India? it sure isn’t as interesting! Wow! Those are some great questions! I’ll try to give feedback best I can in regards to several different issues you bring up. Maybe I’ll include some follow-up posts to those who may be feeling the same way. And, to start off, I can relate to your emotion. I had so many feelings after I heard Shane Claiborne the first time. Overwhelmed. Excited. Inspired. Guilty. Incredulous. Stumped. Annoyed. Disappointed. Cautiously hopeful. A sort-of “Yeah right” feeling. And convicted and challenged. I didn’t even want to think about it for a few months, and so I tried not to. Nothing changed overnight, except the sponsoring of the child. But the seeds were germenating. I wanted his passion. I wanted the reality to be my reality…I’ll come back to this later. You had a couple of questions. One of them seemed to be “what about the average people?”…people who have a ‘normal’ job and who are providing for their family, or just trying to make ends meet and don’t have the privilege or time to embark on some of these adventures? My answer: We all have a job, yes. And as you put it, yours is caring for the dying. Isn’t that what Mother Teresa did? YES!! As she said to so many pilgrims who wanted to come to India and be inspired by her life, “Calcuttas are everywhere, if only we have eyes to see. Find your Calcutta.” So it looks like you have found your Calcutta! What a cool thing – to actually do what Mother Teresa did – help people die well. For the person who works in a cold cubicle, they may see your job as a privilege and status. Anyhoo, we all have jobs. Hopefully in our job, whatever it may be, we are using our God-given gifts to make that job the most incredible thing ever. However, there is a difference between job/vocation, and then lifestyle. Here is where it doesn’t matter who you are, the average person, the missionary, the student, the home-health person, a doctor, an actor, a pastor, a stay-at-home mom…we all partake in different lifestyles. God leads us into different roles, but does He lead us into the lifestyle we choose? Perhaps not. Let me explain: Most of what my love dollar resulted in had nothing to do with my job or how much time I had on my hands. It had to do with oppurtunities that presented themselves where I could choose a lifestyle of apathy, or one of change (which is also uncomfortable most of the time, but the results are excitment and passion). For instance, we didn’t have to sponsor a child for our job. But that requires $30 a month from our account – thus lifestyle choice. So instead of drinking so much Starbucks, we sponsor a child. With Open Table, it did help that I was a Pastor cuz I could do it in place of a church service, which I had certain control over, and had the man-power at my disposal. But anyone else can throw a party for the homeless, or partner up with an organization that already does this. For the Christmas event we now do, that has nothing to do with my job – Steve and I have explained to our families that this is how we choose to spend Christmas, and we do other things with our family, either that evening or on the days surrounding – this involved a lifestyle choice. With joining the steering committee for Fair Trade Healdsburg – this was not apart of my work – this is all in my spare time, therefore, a lifestyle choice. And to be honest, as every part of the chain presented itself (remember this was over a 5 year period, so it didn’t happen overnight…my heart was changing through all of this and still is). Anyways, as every part of the chain presented itself, a part of me didn’t think it could work, or at first doubted and maybe even whined. But it was that apathetic part of me. It was that lazy side in my soul, the side we have to fight against. Like, for instance, I was at first hoping it would end at that sponsored child, cuz then I could say i have done something, but still stay in my comfortable rut. But the other side of me wanted and yearned for something deeper and real. When we at first did Open Table, it was a hassle! We had to find a place to do it, grapple with questions such as “what if the youth hate this?” “What if no one comes?” “What if the conference disapproves?” We had to pay money for it, get transportation, find a date that worked for the city and everyone else, and then invite all the homeless, etc. It would have been easier to just stay inside church and talk about how nice it would be if we one day did something like this. But I was tired of talking about it – my soul wanted something more, and so we dealt with the discomfort and hassle of all the what-if’s and all the planning and organizing, and, looking back, the risk made the outcome that much more sweet! And now since the first Open Table, each one gets easier cuz we now know where to hold the event, who will come, that the kids like it, etc. With REVO – we didn’t think we would raise that much money. And staff were saying it was too much for the students to do. And the time we had to put into to help the students make it happen…but when we saw the payoff, it was sooooo worth it! The joy we saw because of the buy-in we invested was deeply felt. And with the steering committee – I wanted to join, but a part of me knew it would take up time, personal time. Was I really ready for that? I decided “why not?” And I’m SO glad I did! It has made my outlook and lifestyle so much richer, as well as I have met and become friends with people I hadn’t known before – people who share my same passion and therefore keep me accountable to my lifestyle of love and compassion and justice! Buying fair trade – that has nothing to do with our job – but it has become a part of our life, and all outside of work. Lastly, I don’t think God backs us into lifestyles of responsible living…and I guess I’m not sure what you mean by that phrase? But regardless, whatever situation I find myself in, whatever job, whatever bills are being paid, marriage, friend group, I, and all of us, are here for a reason at this time in earth’s history! And I choose whether what direction my life will take. And it’s not great things with small love – the power once again happens in small, ordinary (maybe even average) things but with Great Love behind them. And it does take baby steps. That’s why I included my journey of how each step built on the other…and they keep building. I haven’t arrived – it’s a crazy, wild ride…but anyone can ride it! It’s one thing at a time, building slowly… Like fair trade sugar. When I’m all into cooking with that, then it’s on to the next fair trade thing. Baby steps. 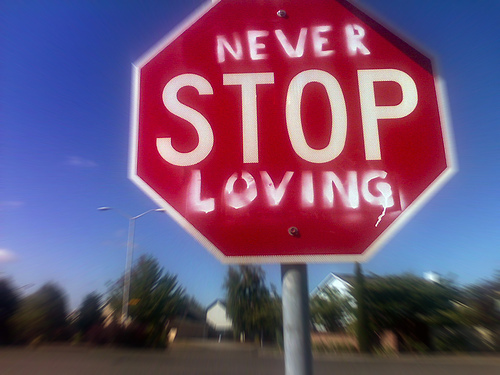 But it’s a process of moving forward, and living the reality of love, in every area of my life. THAT’S WHAT IT WAS! (I think?) Secondly, (referring to the paragraph above) instead of having all these compartments of job, marriage, me-time, church time, free time, etc., the lifestyle of small things with great love takes hold on every part of my life. So yeah, when I need a break from people and I go shopping, I take love into my choice of how I spend, remembering that my money has real-life people on the other end of the supply chain. So maybe I buy fair trade or locally, cuz that’s my lifestyle. When I hang out with our new friends now who are passionate about the same things, and we’re having down time and not talking about Fair Trade or ending modern day slavery, and we’re just talking about our dogs, that’s just as holy a moment, too, cuz our experiences, all of them, are linked with the lifestyle of love, justice and compassion. So even the “mundane” can look different cuz I’m looking through glasses of love. If I’m out to eat and I notice my waitress is having a rough day, because of the lifestyle of love, I see her differently and maybe try to reach past the title she bares and ask her about her day, or tip her bigger, or maybe write a note of encouragement on the tip. So, instead of having all these compartments seperate from each other, they’re all connected and interwoven with the common thread of this lifestyle of “small things with great love”. And it doesn’t matter who you are. Cuz it’s not about that. It’s about LOVE. So whether you’re average or not. And whatever you’re passionate about… This, I believe, is what it means to be the church – and it happens every moment of every day…The thing I have to constantly remind myself is to be aware of this love-reality, and not get sucked into the alternate reality of apathy and selfish living. And for me, it helps to surround myself with people, and just a lifestyle in general that feeds this love-reality. I hope this helps. There’s more I want to say, but I’ll save it for later, cuz this response is dang long! What do you think? Does this make sense? I’ll go over it myself and see if I left any of your questions un-answered… And I think I may do some follow-up posts to how to take those baby steps and fight against the disease of apathy. I’m inspired and in awe at this. Thank you. I really related to what you said about your mixed feelings, totally. When you look at the glimpse of all that love has done here, it is almost hard to grasp, and then as I was reading I kept thinking, this is just one beautiful couple’s story…wow…talk about ripple effect. Because how many other realities are being played out changing the world from that spark Shane inspired that day…and then what about all the sparks you have ignited in all the lives around the world? Totally unfathomable.